SteveAsat Comments: I can overlook an Apple II case with a Commodore PET monitor being used to visually indicate “hey kids, computers!” And the Escheresque architecture suggesting a suburban three-bedroom rendered in granite. But how the hell did that cat get up there and why isn’t he sliding off?! Isn’t that Uri Geller ? If ever there was a man caught looking at “specialist” websites, its this guy. The 1985-model computer was a present? Definitely they should lose it. You would have thought that by the second upon a time we’d all have the idea. But no, they had to go thrice. I think the cat is trying to get away from the miniature dog perched on top of his head. It’s a pretty decent book, though – “near future SF” at the time it was written, which puts it in our past now if I remember right. It’s been a while since I read it. Have you never owned a cat? Finding a cat somewhere it shouldn’t be able to get to is par for the course. Is that another cat on the bannister? Evil Lord: All you have to do to save the world is use that computer. Man: EASY! I’ll just…. HEY…. where’s my graphical interface? That armor has some wacky proportions and why did Bruce Campbell pose for this cover? Dazzling copy from the wizards of the Marketing Department! And don’t say publishers don’t work themselves to the bone for authors! Maxwell’s (the cat) ability to show up in unexpected places was a plot point. 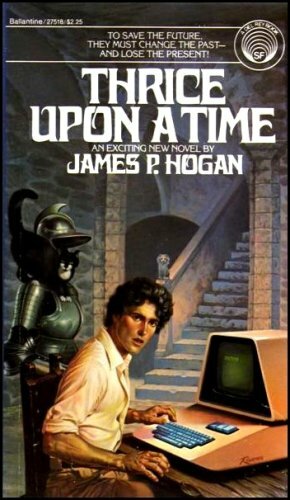 Considering the novel was published in 1980, that was about how computers looked then. I used to own a copy of that paperback, bought in the mid 80’s, and never had a problem with the image. Cats have really good balance. It could stay up there if it wanted. Blame the author: the protagonist, shown in cover actually looking like the description, worked in his grandfather’s Scottish castle. And the cat, Maxwell, really could have gotten up there. IIRC there’s a scene where he gets caught inside that armor. soo..let me get this straight. To save the future I must lose the present in the past to get back to the future? Who is the present for? Why are there cats? Are the cats the present? I have to lose cats? In the future? Can’t we just say that I’ll do it later and leave it at that? Did this time predicament leave him with someone else’s hands? They look the wrong size and from someone decades older. Maybe he had to swap hands with his future self. At the end of the book they are specifically asked to add a 100Mb hard drive for a big message to come from the future, which appears a bit more advanced than the model shown could cope with. Considering the artist seems to have some skill, why do the proportions of everything seem so wrong?